Our Playground Consultant, Luke Banner, met with Zaheen Younis, Assistant Headteacher and EYFS Leader at Lyon Park Primary School in Middlesex, to discuss new plans for their early years playground environment. A small budget had been allocated to improve the small enclosed area but with many ideas and dreams; it was made clear that it was important to be realistic with the budget available. We sat down with The EYFS Lead, Zaheen Younis, and her team to discuss their priorities and what areas of learning needed the most focus within their outdoor space. A lack of exciting early years outdoor play equipment to engage and excite the children. Raising attainment amongst boys to ensure they make enough progress while playing outside. The area lacked storage space which made the area very cluttered, impacting on the appearance and accessibility. Creating an early years playground environment that promotes messy play was one of the key requirements from the school when looking to engage children outdoors. The school's new messy play equipment includes a fantastic Covered Sand Box, Water Wall, Sand Table and Tuff Spot Table. "Children thoroughly enjoy the sand and water products. A large sand pit allows for larger groups of children to work and play as well as having the opportunity to position themselves in a way that best suits the activity with some children preferring to sit or stand in the sand pit. 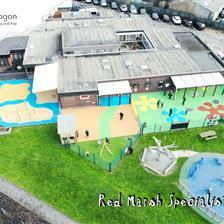 The water area is popular and has helped promote both science, maths, communication and language skills." When we re-visited the school, the children were busy scooping, sieving, digging and building in their new Sand Table and Sand Box. These excellent resources for sand play will naturally develop children's imaginations while improving their teamwork, PSED, communication and language. Our popular Water Wall with Water Play Package, has created an energetic investigative learning zone for the children to manipulate different water routes and begin to understand basic scientific and mathematic concepts; such as the water cycle. While discovering new rotes to flow the water, this brilliant water play zone will encourage children to work in teams further developing their communication, language and PSED. One of the areas which Zaheen and her team identified which needed developing was Mark Making and Literacy. Responding to this, we decided to install a Giant Whiteboard and a Giant Chalkboard on Posts, along with Moveable Artificial Grass Topped Seats to create a comfortable and inviting Storytelling Area. As you can see, the children love reading their favourite stories, while drawing and writing independently on their new blank canvases. 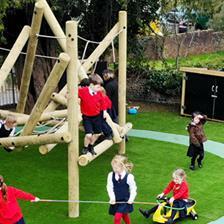 Click here to view our full range of Imaginative and Creative Playground Equipment. One of the main problems before our development was the lack of playground storage, making the space very cluttered; impacting on the accessibility and appearance of the area. We eliminated these problems with our Self-Selecting Stores. The school are now able to promote independence and responsibility over playground toys by encouraging children to tidy up once playtimes are over. Now with less clutter, the playground area stays accessible and looks aesthetically pleasing year round. Complemented with chalkboard doors, the children can further develop their fine motor skills and writing skills in a fun and engaging way. 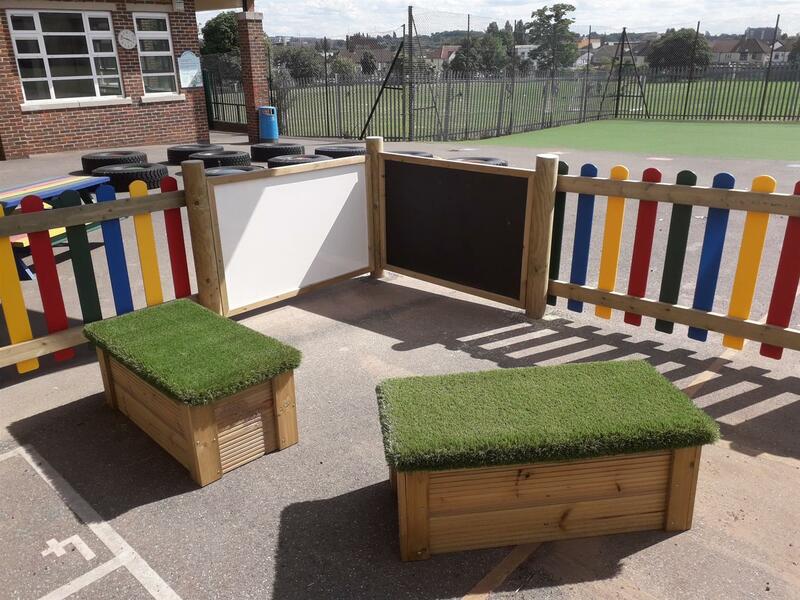 View our excellent playground storage solutions here. "Children are now engaging positively with their new outdoor learning environment and are more likely to access activities reflecting all the areas of learning rather than just physical play. The environment is pleasing to look at, tidy and organised. Storage sheds have made a big difference and helped de-clutter as well as promoting independence amongst children when tidying up." "Working with Pentagon has been a positive experience. The consultant working with our school was very clear in explaining the product and service they provide. Any issues or queries were dealt with in a timely manner and the consultant gave good advice and suggestions during the consultation and planning phase." For more information on how we could develop your school’s early years playground environment, Contact Us through the website and we will be in touch to arrange a free consultation and design presentation. 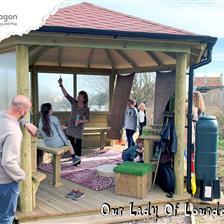 You can view our full range of outstanding early years outdoor play equipment for primary schools and nurseries here.